Christmas is always coming! Whether it’s 364 days away or tomorrow, it’s always the perfect time to begin thinking about snowmen. This pattern makes up quickly and by using different colors of thread and yarn can be made for Christmas at the Beach (as mine is) with a sporty Panama hat or in the more traditional look with a Cossack-style hat and perhaps a red or gray fuzzy scarf. Use a hook one size smaller than is recommended to create a tighter fabric that your stuffing won’t escape or show. For the snowman’s body, I used a size F crochet hook. For the nose, eyes, buttons, and scarf; I used a 1.25mm crochet hook and all 6 strands of DMC-type embroidery floss. For the crochet panama hat I used a hook one size smaller than the yarn manufacturer recommends. White 4-ply acrylic yarn. (I had some mystery yarn that I used, probably a bit of Red Heart. Row 1: 7sc circle, using Magic Circle Technique. This is a good time to stuff the bottom circle or your snowman. If you want to weight your crochet snowman down so that he/she will stand on their own, insert some plastic pellets after first lining the bottom with stuffing. The lining will help keep the pellets from working their way out between your stitches. At this point I stuff most of my crochet snowman’s head. Don’t fill it so high that you can’t work the last 2 rounds without pulling some of your stuffing through your stitches. Cut end leaving a longish tail. Make a slip stitch into the next stitch and pull the tail all the way through to end. I’ve found I can make a much flatter finish it I “sew” the end closed. With the tail on one side, insert the hook from the outside into the stitch directly opposite from the tail. Pull the tail over the edge and through the stitch with your crochet hook. Turn your Beachy Crochet Snowman and insert your hook from the outside in a stitch opposite the tail and pull tail over the edge and through the stitch with your hook. Continue until your opening is closed and no opening is big enough for your stuffing to escape or be seen. Continue working around until you like the length of your nose. Use a slip stitch to end. You will notice that one side of your carrot nose has a bit of a hole. Insert your crochet hook at the wide end (opening) and through that hole. Pull the beginning thread/tail through the hole and out the opening of your nose and pull snugly but not so tight as to bend your nose. 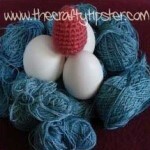 Use the ends of your yarn to gently stuff your nose; trimming the length of the ends as needed to not overstuff. Use 2 strands of orange floss to sew nose onto your Beachy Crochet Snowman’s face. Make a circle with 8 stitches. Slip stitch to end and weave tail over and around the outside loops to create a finished edge. Use 2 strands of black floss to sew eyes and buttons onto your snowman. What makes this hat so much fun to make is that it goes from a floppy nothing to a hat quite suddenly. Stitch count is not as important as making the beginning and end of each row as hidden as possible. Due to the way this hat is constructed you will need to gently stretch out the stitches near the top edge of the hat and the main column to hide the increases and decreases. Row 1: Create a 6 stitch circle, slip stitch to join row. The next two rows will be very noticeable on your hat – be sure not to split threads or miss stitches. Row 4: Working only in front loop (side facing you) make 2 dc in each stitch, slip stitch into ch 1 to join row – your hat will be ruffly at this point and look decidedly unhat-like. 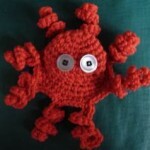 Row 5: Decrease in every pair of stitches, slip into ch 1 stitch to join,c h 1. Mark the beginning of the row with a stitch marker or contrasting yarn. 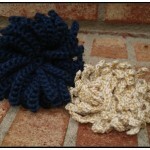 Now working in spirals/Amigurumi style, continue crocheting rounds until your crochet top hat is the height you desire. Be sure to stop near where the rows begin. Gently stretch and shift the stitches to shape your crochet Panama hat. Row 1: Return to using the smaller hook or tighter stitches. Ch 1, alternate 2 dc (increase) and 1 dc in each stitch around, working only in front loop; join with a slip stitch into ch 1. Row 2: 1 dc in each stitch, slip stitch to join, ch 1. Row 3: [1 dc, 2dc (increase), 1dc] around, slip stitch in ch 1. 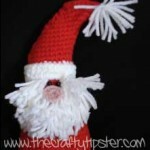 To make your crochet snowman with a more Scandanavian or Russian flair, skip making a brim and proceed to the finishing. You can make a scarf in any number of ways. The crochet scarf I made used all 6 strands of embroidery floss. I made a row of each color and left the ends for the scarf’s fringe. I shifted some of the ends to make them closer together by looping the end through the stitch of the row beside it (it may take more than one try to get it in a good position). When I had the ends fairly close together and laying flat, I trimmed them to the same length and split the 6 strands of each color. Depending on the yarn you use for your scarf you may require more or less rows. 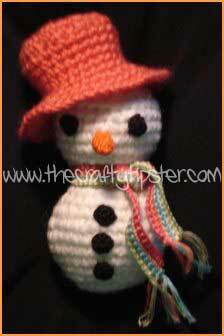 Make your scarf a length that will allow you to tie or otherwise attach it to your Beachy Crochet Snowman. Your snowman will look better if you make a scarf that uses yarn or threads that are smaller than the yarn you used to make your Beachy Crochet Snowman. Sorry for the oh so late response. Most all of the stitches except for the nose are regular crochet. I’m not sure a symbol pattern would make this any easier for you. What I found when I make a new pattern is it is much easier to just dive in and try to make it and decipher the pattern as I go along. With Amigurumi pieces, most of the time a few mistakes here and there won’t really matter much in the end and just make your piece a little more unique.